Since yesterday was Memorial Day, I searched for patriotic women to quote, and I stumbled across Julia Ward Howe, who not only wrote a song familiar to many of us, but fought for women’s rights. Here’s a little more about her. 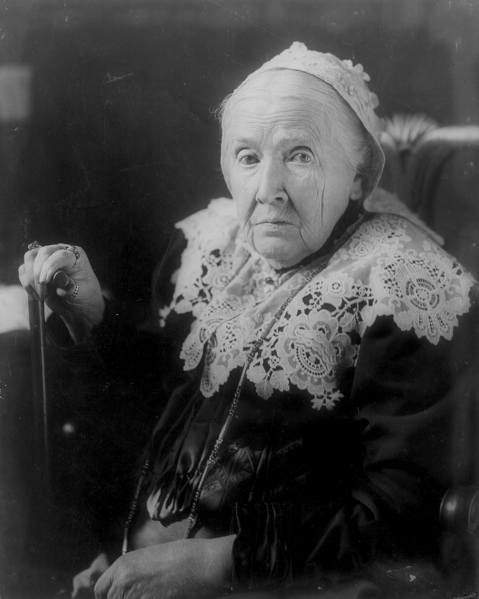 Julia Ward Howe (1819=1910) was the author of The Battle Hymn of the Republic. She was inspired to write it in 1861 after meeting President Lincoln. A poet and social activist, she became the first woman to be inducted into the American Academy of Arts and Letters. She advocated for women’s education, forming the Association of American Women and serving as its president from 1876 to 1897. To find out more about her, you can read her biography HERE. I have to laugh at that third quote… so true so often. And sadly, so often true of myself. I’m going to try to remember that next time I obsess about something unimportant! This entry was posted in The Quotable Nerdy Chick and tagged Battle Hymn of the Republic, Jula Ward Howe, Patriotic Women, Women Songwriters. Love that third quote, too. In Howe’s day, many women were only allowed to pursue trifles. I read that some schools were named after her, Tina. That is cool that you have a connection. You’re right, Mary, about what was allowed back then. At least today when I pursue trifles, it is usually by choice!